It's sad to say, but hyenas have been given a bad reputation over the years. Many Africa folklore traditions believe that these creatures are the 'Scum of the Earth'. But do hyenas really deserve this? This negative image may have started in prehistoric times. It has been noted that hyenas (spotted and stripped) preyed on early humans and it is this practice of hunting humans and scavenging carcasses that has led to their position as vile creatures. In West African folklore, hyenas are seen as dirty, immoral animals that are in cahoots with witches. In certain sections of Tanzania, when a hyena howls on the night that a child is born, legend has it that the child will grow up to become a thief. Throughout the Middle East, hyenas are seen as the incarnations of djinns that have become corrupted by the world. The arabic writer, Al-Doumairy, described hyenas as vampires that roamed the night and sucked the blood from brave people. This may account for the proliferation of the idea that hyenas are cowards. Even Christian and Jewish traditions hold these poor creatures in low esteem. One legend states that hyenas were never actually part of Noah's famous ark, but were sired after the Great Flood through the exploits of a randy dog and a naughty cat. The animal's constant cackle is viewed as a sign of their stupidity. However, there are a few bright spots in the reputation of the hyena. The Tabwa people of East Africa and southwest Tanzania have a creation story in which the spotted hyena gives warmth to the cold Earth by creating the sun. In rural parts of Afghanistan, India, and Palestine, despite their loathsome reputation, hyenas are slaughtered to create love potions for the lonely. As more research emerges about these oft misunderstood creatures, many of the negative myths and misconstructions will hopefully fade under the light of knowledge. But one thing is clear, hyenas aren't as they appear to be. Bad blood between humans and hyenas mean that it's very rare to find anyone sporting a Hyena Tattoo. Generally, such an artwork is deemed to be reserved for social outcasts, who, like the hyena, is misunderstood by the world at large. But behind the surface, hyenas are wonderful animals that deserve our time and attention. 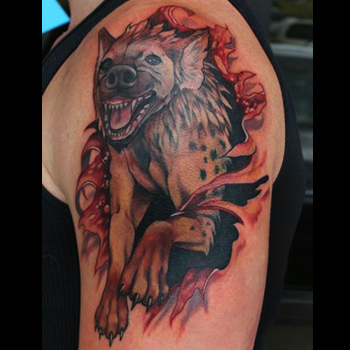 Should you choose to get a Hyena Tattoo, you should be aware of the social connotation that such a piece carries with it. But regardless of what others may think of your new tat, the most important thing to note is what the tattoo will symbolize to you. If you need some inspiration when designing your new artwork, then visit our design page and take advantage of our Custom Service. Our team is more than happy to help you create a unique masterpiece.